The Special Air Service (SAS) Regiment is the world's most deadly elite military unit. From spectacular hostage-rescue operations in the heart of London to covert counter-terrorist missions in Northern Ireland, the soldiers of the SAS are second to none. 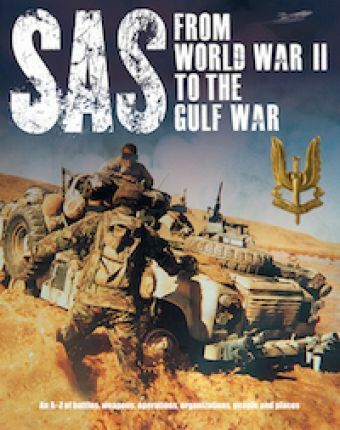 SAS: From WWII to the Gulf War 1941-1992 is the ultimate reference work on this famous organisation. With the aid of more than 600 alphabetically arranged entries, the book offers the reader an in-depth analysis of every aspect of the unit's 50-year-history. All the Regiment's battles and campaigns, together with their economic, political and strategic background, are listed. In addition, the weapons, equipment and techniques used by the Special Air Service are given in full. Biographies of all the leading personalities that have worn the famous winged dagger badge, men such as `Paddy' Mayne, David Stirling, the Regiment's founder, and the man who commanded British forces during the First Gulf War - Sir Peter de la Billiere - are included. Accessibly written, and illustrated with 80 colour and 60 black-&-white photographs, as well as 15 maps and diagrams, SAS: From WWII to the Gulf War 1941-1992 is an expert reference work on the elite of elite special forces. Peter Darman used to be a research officer with the British Defence Intelligence Staff, compiling reports on the military capacity of the Warsaw Pact but now writes military history books.